After the exciting news that has made happy all Foxy fans, let's take a look at what's coming with Play It Again, Sam: The Fox Box is released by Cherry Pop on 27 July 2017 with the cat. reference FOXBOX001. Play It Again, Sam: The Fox Box is the long-awaited, first-ever definitive retrospective of Samantha Fox’s musical career to date. Marking three decades since this undisputed icon of the 80s first topped the world’s charts. This lavish 2CD + 2DVD box set is replete with a fold-out double-sided poster, a set of button badges and a picture-packed 32-page booklet. This is an essential package for Sam’s army of Foxy fans and all self-respecting aficionados of 80s pop culture. The definitive Samantha Fox singles collection, CD1 brings together every single released during her phenomenally successful Jive Records tenure for the very first time. From the unforgettable 1986 smash ‘Touch Me’ to the Stock Aitken Waterman favourite ‘Nothing’s Gonna Stop Me Now’ and the Full Force classic ‘Naughty Girls’, the succession of global hits which made Sam the only British female to score a hat-trick of Top 10s on both sides of the Atlantic during the 80s are all present and correct. Successes from the years since, including the dance floor favourite ‘Santa Maria’ and an irresistible cover of Blondie’s ‘Call Me’ with fellow 80s icon Sabrina, bring the story up to date. An exclusive, previously unheard bonus track, ‘You’ve Got Me Believing In Make Believe’, direct from Sam’s personal archive, rounds out the selection. CD2 features many sought-after and previously unavailable rarities from throughout Sam’s career. Always eclectic and never just a ‘model-turned-singer’, she convinced as a rock chick one moment and a trend-setting dance diva the next. Here, her choice of collaborations ranging from legendary space rockers Hawkwind to acid house pioneer DJ Pierre sit alongside covers of favourite acts such as The Beatles, Donna Summer and ABBA. With B-sides, remixes, an updated take on ‘Touch Me’ and another exclusive track, ‘It’s You’, there is plenty to discover for diehard fans and newcomers alike. Play It Again, Sam also boasts all of Sam’s classic videos to date, many of them on DVD for the very first time. In the age of MTV, Sam’s early success as a model immediately translated to the small screen in a series of memorable promos, helping to consolidate her chart success worldwide. DVD1 gathers together Sam’s iconic original videos, with DVD2 featuring additional rare footage, including the seldom-seen early video ‘Rockin’ With My Radio’, extended and alternative takes, interviews and behind-the-scenes footage. Sam is currently putting the finishing touches to her autobiography and a long-awaited new studio album. Following Cherry Pop’s bestselling Deluxe Edition reissues of her four Jive studio albums, ‘Touch Me’, ‘Samantha Fox’, ‘I Wanna Have Some Fun’ and ‘Just One Night’, we are delighted to continue our successful partnership with one of the best-loved British pop artists of the 80s. This is the news we all have been waiting for! Play It Again, Sam: The Fox Box is going to be released on 28th July 2017, the star has announced it on her Facebook page. This special release is already available for pre-order on Amazon UK. Foxy fans in the UK don't miss Sam on Saturday 26th August when she will perform at the Livewire Festival in Blackpool. Jason Donovan, Sinitta, Go West and Nathan Moore will also appear that night with others as part of The Hit Factory evening. Visit the Livewire website to find out who's gonna be there and to buy your tickets. The big musical event of the Summer in Slovenia will take place in Lasko and will present a huge line-up of performers from 13th to 16th July. Samantha Fox and her band are scheduled to hit the Jubilejnik stage on 15th. Tickets are already available on the official Pivo Festival webpage with all the info you need. It's gonna be an awsome Summer for all Samantha Fox fans in Europe who will have the chance to see the lady performing live in various Countries. Add them to your agenda and get ready to party! 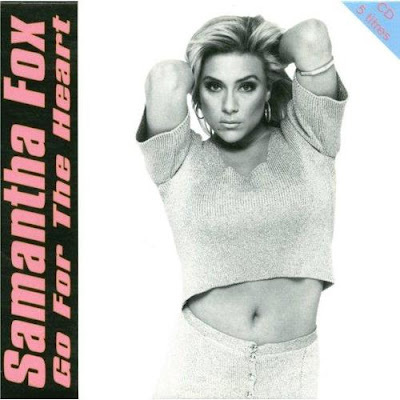 It's that time of the year when music fans cannot miss the Eurovision Song Contest that is happening in Kiev (Ukraine), and foxy fans certainly remember the brilliant Go For The Heart that Sam presented together with S.O.X to the event as the UK entry. Go back to 1995 with the official music video below. And take a look at all the different releases of the song collected into the SamFoxItalia discography page. Here are videos of Samantha Fox playing her hits at the latest concert in Norway on 6th May 2017. Watch here some live videos of Samantha Fox performing in Sofia on 29th April 2017.